Sorry for the last minute post, but just learned about this meeting and wanted to help spread the word. One of the more interesting discussions about public space in the East End over the past few months has been around the future of the Enright Parklet. A small public park located in East Liberty. Google maps shows that Enright Parklet is in the middle of the Penn Plaza green space, from the street, I am not sure if this space looks very green, so it would be easy to miss this little park if you were just driving down Penn Avenue. 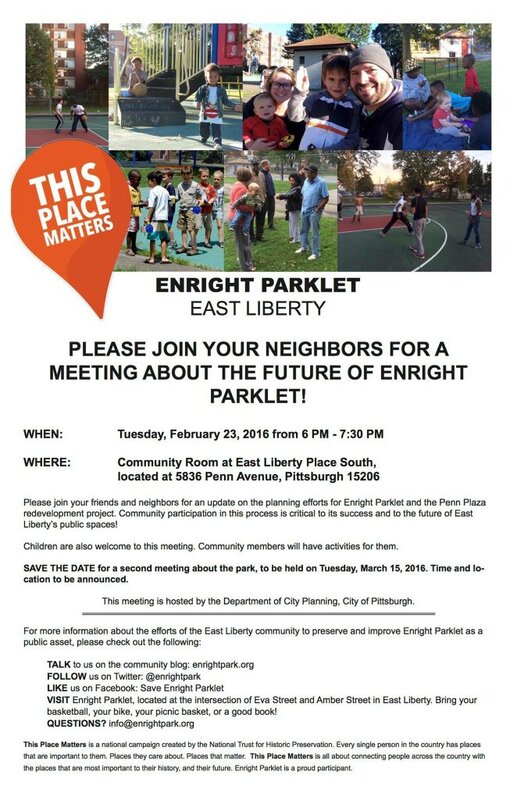 Tonight, Tuesday, February 23, 2016, the Pittsburgh Department of City Planning will host a community meeting on the Enright Park. Facebook Event for Enright Park Community Meeting: http://on.fb.me/21dt2OF. Read more about the community meeting the Post-Gazette here. For more information on Enright Park check out EnrightPark.org, Save Enright Park on Facebook and follow @EnrightPark on Twitter.